Abrams Wins first Feature in Exciting fashion! Rushville, Indiana’s Garrett Abrams picked up his first career Kelsey Chevrolet Sprint Car Feature win at The Lawrenceburg Speedway Saturday night. Abrams has been close in the past, but never could break down the door to victory lane. Mike Miller jumped to the lead on the opening lap of the 25 lap A main. Former track champ Joss Moffatt wrestled the lead away from Miller on lap 5 and looked poised to get the so called “monkey of his back” and pick up the feature win and struggling with bad luck night after night. As the race reached its half way point, it was the clear Joss Moffatt and Garrett Abrams had the cars to beat. Abrams was using the high line whereas Moffatt was on the low side of the track. With the momentum being on the high side, Abrams was slowly pulling in Moffatt and made his move around the outside on lap 21. The races only caution would slow the field on lap 22 for a restart. This time Abrams and Moffatt had a third contender to deal with in the likes of Shawn Westerfeld. The last 3 laps were nothing short of breath taking as Abrams and Moffatt fought hard for the lead with Westerfeld lurking behind. On the white flag lap, Moffatt threw everything he had in turn 3 getting around Abrams on the inside only to find himself drift high in turn 4 allowing Abrams to pull off the dramatic cross over move and beat him back to the checkered flag for an exciting feature finish. It was Abrams first career victory at the 3/8 mile high banked speedway. Moffatt held on to second followed by Westerfeld, Cummings and Mike Miller. Heat race winners were Brett Hankins and Joss Moffatt. 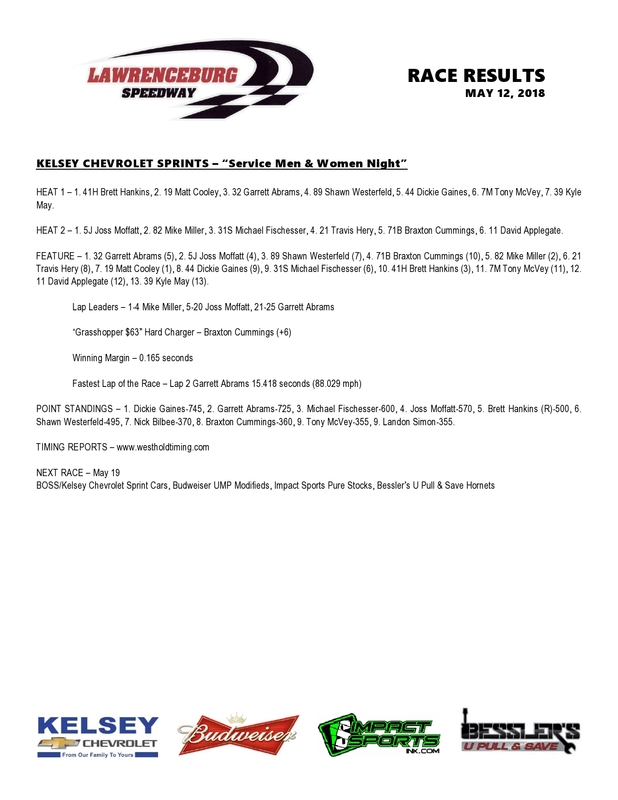 The Kelsey Chevrolet Sprint cars will return to the Burg on Saturday May 19th, alongside the Boss Sprint Car Series. Hamilton Wins 3rd of Year at Lawrenceburg! Everyone knows that Matt Hamilton is good. But do people really know how “good” he is? He simply is as good as anyone in a UMP Modified. The Aurora, Indiana native won for the 3rd time at Lawrenceburg in 2018. Not bad for a guy that’s only raced 3 of the first 4 events at The Burg. What may be just as impressive as his 3 wins is that he isn’t always starting up front. Hamilton took the green flag from the 8th position for the 20 lap Budweiser UMP Modified feature. Kris Johnson led the opening 3 laps of the race before giving up the lead to series point leader Brad Wieck. Hamilton had made his way to second and on a restart following a caution, he was able to find some grip on the high side and take the lead away from Wieck on lap 11. Hamilton would lead the remaining 10 laps. Kyle Schornick finished second followed by Brad Weick, Jason Jameson, and David Spille. Heat race winners were Alan Ketcham, Kyle Schornick, and Brad Weick. Cory Skipton won the B Main driving Adam Love’s car after Skipton had mechanical issues in his heat race. 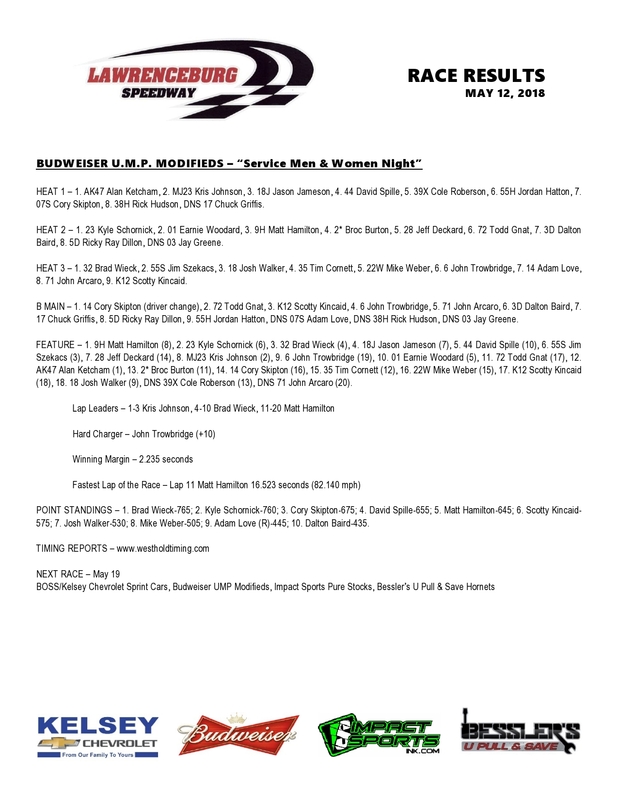 The Budweiser UMP Modifieds return to Lawrenceburg on Saturday May 19th. Champ Moore wins Second Hornet Feature of year! Cordell Moore had to earn this win more than some of the other races he’s won, but it was worth it. Being the defending champ, the other drivers have their eyes set on you to try and beat you every week. At the checkered flag, Moore would cross first, and he won for the second time in 2018 for his 4th career win at Lawrenceburg. Kevin McCoy led the first 6 laps before surrendering the lead to Moore who led the res of the way. Michael Freimuth II ran third followed by Dallas Miller, and Travis Butte. Heat race winners were Dallas Miller, Cordell Moore and Ron Rose. Tyler McGhee won the B main. 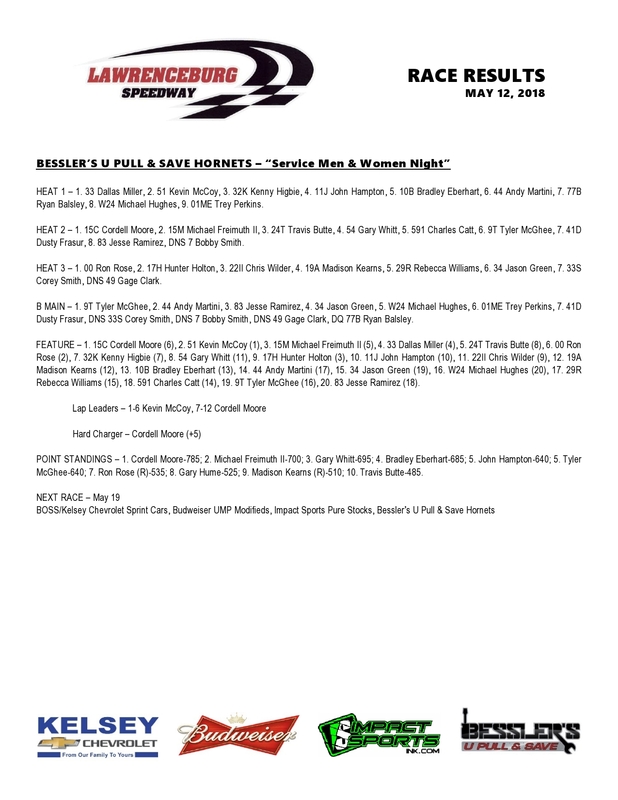 The Besslers u Pull N Save Hornets return to Lawrenceburg on Saturday May 19th. Defending Champ Grace Finds His Way Back to Victory Lane! Don Grace didn’t know if he would win this year, he admitted in victory lane. He said there are a lot of fast cars, and a different winner each week. Don Grace is humble in what he says because in the Prestock class, he is still one of the best there is. He didn’t have it as easy as he would have liked as first time Purestock driver Dalton Fleenor, was fast and led the opening lap. Grace took the lead on lap 2 and led the remaining laps. Last week’s feature winner Steve King ran a strong second followed by Fleenor, Danny Eichler, and Dalton Smith. Heat race winners were Danny Eichler, and Don Grace. 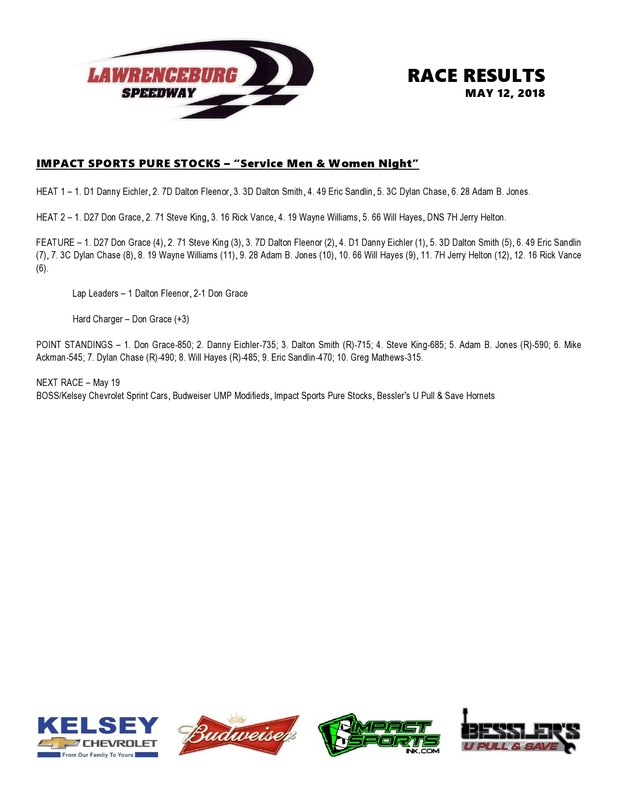 The Impact Sports Purestocks return to Lawrenceburg on Saturday May 19th.